Landscape photography has always been an interest of mine. Until recently, however, I didn’t understand the depths of its cultural and socio-political significance. In the beginning, it was Ansel Adam’s sublime images of the American West that captivate my attention. It wasn’t until a year ago when I began studying contemporary artists such as Richard Misrach and Edward Burtynsky, that I began to realize the cultural significance and global implications of landscape photography. It is indisputable that Ansel Adams surreal images of the American West advocated for the preservation of the natural landscape and help establish Kings Canyon as a National Park. Tragically Ansel Adams surreal images had the unintended consequence of making the American wilderness a commodity. It became so popular that it turned the national parks into a highly sought after vacation destination and tourist attraction and as a result, the National Park Service quickly became overwhelmed. While it is not a direct cause and effect relationship, it’s not hard to see why contemporary artists would address issues facing the natural landscape differently. To avoid the unfortunate trappings in viewing the landscape singularly as an object of beauty and awe, modern artist such as Misrach and Burtynsky, address this problem by seducing the viewer with its beauty but at the same time reflect on our encroachment upon nature and as a warning of abuse. Richard Misrach’s photograph, Submerged Lamppost, Salton Sea, California, stylistically captivates us with sublime compositional elements, such as the warm pastel color hues of the sky, a luminous horizon, and its reflection on the glassy still water but it becomes quickly noticeable that something is very wrong. The devastation of the submerged community as the result of failed damming efforts is shocking. What might be something that we quickly scan and move on from instead has an arresting effect. I can’t help but consider what has happened, that even seemingly best-laid plans in the pursuit of modernization and development can have miscalculations and grave consequences as a result. 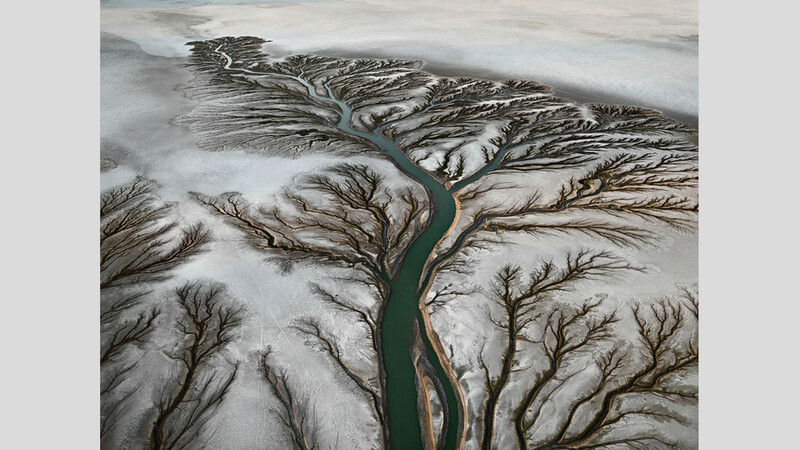 In Edward Burtynsky’s photograph, Colorado River Delta, I was taken by the tree-like representation of the landscape. I was shocked when I found out what I was looking at and the cause of it. Several rivers were damned and subsequently diverted to vast western communities with developing agricultural industries. As a result, over 1,930,000 acres of wetlands and natural habitats were affected. It’s clear that development is unavoidable. Reflecting on this both photographers continue to use sublime elements in their work however they also address contemporary issues of man-altered landscapes and give caution by directly documenting the possible consequences of irresponsible development and urbanization.